A cardboard bicycle might sound flimsy, but the company behind the idea is backed by a solid business plan, and social and environmental innovation as durable as the string material the company produces. Fairplanet spoke to Cardboard Technologies Founder and Co-CEO Nimrod Elmish. Cardboard Technologies began as a garage start-up in Israel about nine years ago when Elmish’s childhood friend Izhar Gafni got to work thinking about technology that could transform cardboard into a durable raw material that can be used for producing bicycles en masse. The first implementation of the material was a cardboard bicycle. Presented to the world in 2013 to much excitement, the bike demonstrated the durability that could be achieved with cardboard. Cardboard Technologies have spent the last three years speaking with potential partners and honing the technology to develop their first three products: the cardboard bike, the cardboard balance bike (for kids learning to ride) and the cardboard wheelchair. The team didn't want to reduce the quality of their product by giving in to the pressure to produce their first product quickly. Thankfully their investors and shareholders have been supportive. Now finally Cardboard Technologies are just about ready to take their products to market. Bicycles and wheelchairs are simply the first implementation of what they hope will be a wide range of solutions using the recyclable, durable cardboard material. The innovation comes backed by a strong business model that matches environmental care and social responsibility with profitability. From the material used to the humans involved – both producers and users – it is clear that great care has been taken to be socially and environmentally responsible without compromising the business’s viability. The environmental impact of Cardboard Technology’s work is both thoughtful and broad. In its simplest form, they’re offering an affordable way to avoid CO2 emissions and encourage recycling by producing a bike that costs approximately one quarter of the price of an average metal bike. 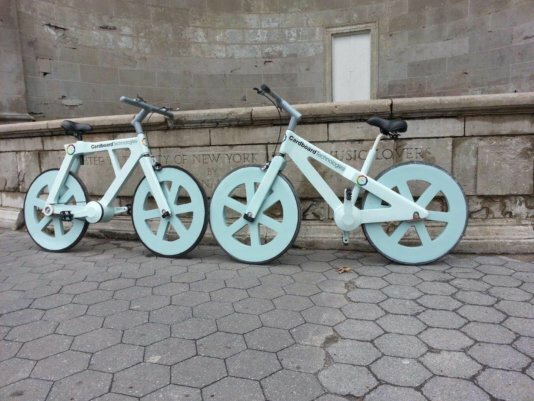 Cardboard Technologies also has a vision to be part of bike-sharing programs in cities across the world. 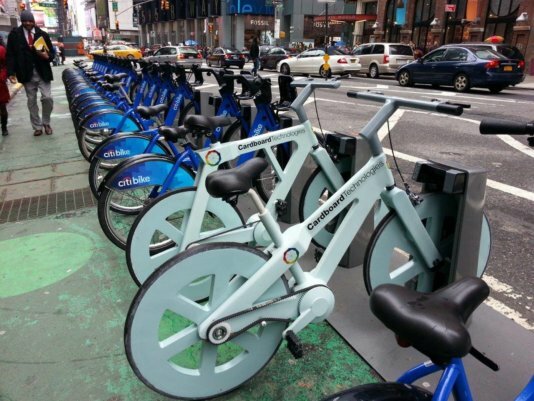 They have already been in talks with local governments as well as companies about the possibility of having companies purchase the affordable bikes and donate them to social projects, made affordable by the generous tax break afforded to recyclable materials and the branding an PR opportunities. As for producing the bikes and wheelchairs, the recyclable materials used in their products – cardboard and plastic bottles – can be found almost anywhere. This contributes to waste reduction. But further than that, “the materials that we use can be recycled again and again and again, and turned into something else”, says Elmish. While the products have been designed and tested to run without maintenance – no lubrication needed, or new parts – for 3-5 years, when they do finally wear out, the materials won’t end up in a rubbish dump: they can be turned into something else. This is particularly notable because Cardboard Technologies is interested in having the bicycles used in social projects, including in third world countries. They want to make sure that the products they send out into the world won’t end up costing the environment at the other end. Elmish sees the scope of the company’s social impact running the gamut of users from elderly people in Japan to children in sub-Saharan Africa, and including production line workers as well by creating local production opportunities for the aged and under-employed. But they’re also interested in solving culturally specific challenges. Elmish explains that in Japan, which has a vast aging population, the national health system provides a wheelchair for every aging person who needs one. However, because of the Japanese custom of separating footwear for indoor or outdoor use, people don’t want to bring their dirty wheelchairs inside, leaving them to choose between using their wheelchair inside or outside. “And we’ve learned that in Japan the cost of these wheelchairs can range between $300-350 and even more,” says Elmish, making it unaffordable for the state to provide two wheelchairs for every person who needs one. However, cardboard wheelchairs, at a B2B cost of around $49 per unit, could make separate wheelchairs for indoor and outdoor use a reality. If healthcare companies want to purchase the wheelchairs, the impact of being able to brand them and recycling tax breaks should make it possible for companies to provide these wheelchairs to the elderly free of charge, says Elmish. It’s hard to imagine cardboard vehicles or wheelchairs standing up to the elements. But the company has put their products through rigorous testing and is confident in the results. “We had to throw the bikes into the sea, we surfed waves with them, and we take the parts that we make and put them into a dishwasher for hours for testing,” says Elmish. As it turns out, the cardboard is water resistant. This ensures that when a parent is showing their child how to use the bike, they can put their full weight on it. Elmish says the balance bike will be their first product on the market, spreading the company’s environmentally-friendly message. As for the future, Cardboard Technologies wants to get its first products to market. But Elmish says their long-term hope is to be able to produce housing relief in disaster situations, by developing a machine that can produce walls and roofs from the cardboard material. Cardboard Technologies continues to search for the right partners and investors, to expand and establish the production facilities worldwide. With a solid vision of the future, we look forward to seeing where they go next. Cardboard Technologies began as a garage start-up in Israel about nine years ago. 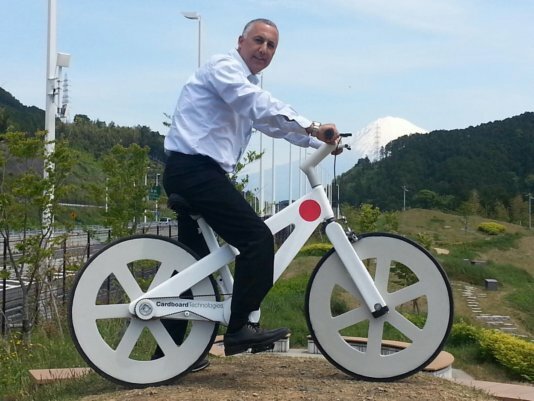 CEO Nimrod Elmish on one of his bikes in Japan. Could ‘smart growth’ ever take off in the UK? The American’s and Canadians call it ‘dumb growth’ - its stains are visible in every community. But is the alternative 'smart growth" the answer? Renowned American sociologist, Charles Horton Cooley once said “An artist cannot fail; it is a success to be one”. The geothermal energy being tapped in the Kenyan rift, is said to be capable of powering 150 million homes. As a vast majority of the world’s population is exposed to toxic air on a daily basis, an increasing number of people seek new ways to access clean air. Young Ghanians have taken the driver’s seat in advocating for an environmentally clean country; music, the language spoken by all, may save the day.